Biography: Alicia Galarza a seasoned marketing professional and a community activist. In 2017, she received a Nickel Belt Pin for excellence in community volunteerism by Hon. Michael Levitt. Alicia received this honour for her contribution to the Hispanic Community here in Toronto and her contribution in creating the first Scholarship in perpetuity called "Conoser Scholarship Fund" for in need hispanic youth, administered by York University Foundation. The objective with this volunteer job is: to advance education for the benefit of Spanish‑speaking youth and children by providing opportunities for youth development by offering outreach, leadership training programs, workshops and instructional seminars on performance and visual arts ,and, by providing opportunities for students to publicly exhibit, present, or perform their works, or develop their crafts or skills in conjunction with these learning activities, and also to advance education by providing scholarships to Spanish‑speaking youth to encourage academic excellence. Alicia’s community volunteerism ranges from community communications both in radio and television to art and culture. Alicia is an integral part of the Hispanic Community. The Red Shoe Movement named her one of the most influential leaders in personal growth and achievement. Alicia has been integral in C.C.I.E Festival of Images and Words, which helps showcase the richness of the literary and artistic abilities of Hispanic-Canadians. She was officially recognized by the Municipality of Toronto as “Cultural Ambassador”.She also received an award of merit from York University-Glendon College in appreciation of the support given to the dissemination of artistic and cultural values associated with the Hispanic world in Canada. In 2003, she was invited to join the Radio Voces Latinas crew. As a masthead founder, volunteer and marketing expert, her role was instrumental in the establishing a community radio station and program offering settlement information to newcomers. Alicia was instrumental to negotiate programs with Rogers TV. Her dedication lead to the first program dedicated to children's audience before she launched Hispanos en Canada TV. A show dedicated in celebrating the Hispanic Community here in Toronto. In 2018, she was invited to be part of the Board of Directors of Artxplosion. The organization responsible for the yearly Pan-American Food and Music Festival. Alicia's volunteer missions have produced tangible results, her dynamics and enthusiasm empower the Hispanic community. Alicia’s started her marketing career with a multinational company in Ecuador. She was part of the activations teams which was responsible for launching international brands such as: Ernest and Julio Gallo-Winery, Sara Lee, M&Ms, Tequila Charro and Vina Tarapaca to name a few. 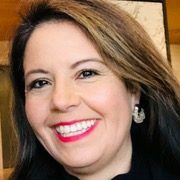 Alicia Galarza is currently a Business Consultant for Latin America at International Technodyne Inc. “Alone we can do so little, together we can do so much”. Helen Keller.